To show an enviable figure is very simple if we know what clothes goes better with our body shape, what we like to highlight and hide some defects. Some garments are allies, and no doubt skirts are one of them, which in addition to make us look more beautiful and feminine, if we know how to use them can look more thinner, with more petite form and even less, meet here the type of skirt that goes with our body type. The rectangular body is characterized by its proportionate measures, but with little waist marked. 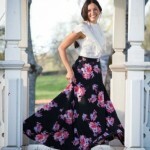 It is recommended if you have this type of body wear skirts to the waist and with a length not exceeding your knees. Skater skirts, or with folds are a perfect choice. Avoid straight skirts below the knees, since it focus the attention on the middle part of your body, by subtracting volume at your hips. In this type of body the shoulders and chest protruding to the size of the hips. For this silhouette it is advisable to highlight the lower part of the body, and avoid striking accessories at the top. Give a curvy look to your figure using a midi skirt, which are those that adhere to the waist and reach below the knee. We also recommend pleated skirts, in light colors, to give the illusion of a larger size in that area. Prevents the faults to the hip or very tight. The hourglass body stands out for having provided a much defined waist, shoulders and hips. This form of body will go all styles of skirts, except for the globe-shaped cuts to hip height, as might seem more robust and even shorter. Take advantage of your curves and wears a origami style skirt, or emphasize them with a pencil skirt. Avoid the prints in the lower part. If you have thin shoulders and tend to gain weight in the middle part of your body, then this is your figure. Get party with a skirt which length may be above or below the knees, but never to average calf or leg. 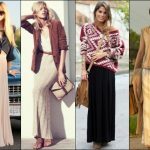 Also straight or tube skirts will make you look more slender; try matte or dark tones to give a slimmer appearance. Avoid skirts with volume and colorful prints. This body shape is distinguished by thin shoulders and wide hips. If you have these characteristics you choose long skirts or knee-height, ideal cuts for you are above the hip and below the waist, thus not focus attention on your curves. We advise you to exploit the accessories and details in the upper part of your body and avoid very tight or pleated skirts.